Having not long finished Markus Zusak’s The Book Thief, which was set in Germany during the 39-45 war, with a child heroine, I was not particularly looking forward to reading The Blue Suitcase. Part of me says, yes we know it was awful and yes, we know how awful it was and in so many detailed ways, they weren’t just numbers, they were real people – but it is just so depressing, there’s nothing uplifting about it, why do we have to keep going back to it? And as soon as you say that, you have your answer. Because we must not forget. Ever. There is just the slightest chance that we may learn from our mistakes and not repeat them. We don’t seem to learn and we dorepeat our mistakes but if we are allowed to forget, the chance goes altogether. 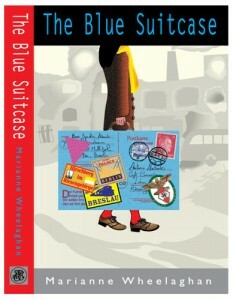 The Blue Suitcase comes with a double whammy because it is set in Silesia, in the north east Germany, a part of Germany which was lost to Poland after the war, its own people displaced and victimised. 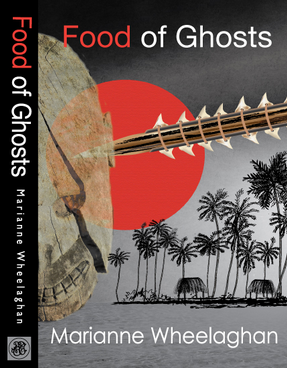 But the interest for me throughout this book is less the history and more theway in which events are interpreted by different family members. There are the parents, professional, religious, humanitarian; Mother is a devoted doctor and thinks it is ridiculous that non Aryan doctors and nurses can no longer be employed when they are so badly needed. Father sees the economic benefits of Hitler’s policies to begin with but doesn’t see why they have to denounce their religion and join the Party. The older son, Hansi, has bolshevik leanings and is opposed to Hitler’s increasing powers, which he sees as threatening their liberty. The younger son, Hubert, sees the potential for strength and growth of the country by eliminating weakness and enthusiastically joins the Hitler Youth Movement. The two older sisters have ambitions, one to be a nun and the other to marry her sweetheart and have a family, while our young heroine Antonia follows the plot through family arguments. And so power swings, atrocities increase and war begins. It is nothing short of a miracle, given the hardships endured by those imprisoned, those fighting and those left behind, that almost the whole family is still alive at the end of the war. The only casualty is Antonia’s mother, who loses her mind worrying about her oldest son, in a labour camp in Russia, and narrowly escapes euthanasia, only to die of complications following an operation on a prolapsed womb. Sister Maria, wanted to be a nun but allowed herself to be blamed for something she didn’t do to shield her mother’s peace of mind and married Georg, a ‘brownshirt’ who enjoys certain privileges. They move to Berlin. When she doesn’t become pregnant he has to divorce her and remarry. Instead, it is Sister Hilde who goes to Holland for religious training but this is interrupted when her father can no longer afford it and she returns home. Brother Hubert returns from the front and even Hansi survives the Russian camp, only to collapse and die within a week of being freed. Antonia survives the seige of Breslau, the bombing, the starvation and the eventual occupation of Silesia by the Russians. She comes to Edinburgh to train as a nurse, bringing with herthe blue suitcase which has accompanied her everywhere. 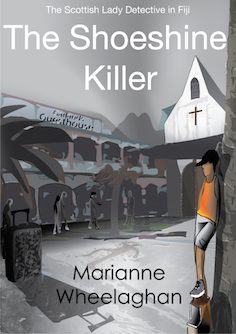 The author, Marianne Wheelaghan is her daughter, who found thesuitcase with notebooks, diaries and newspaper cuttings on top of a wardrobe when Antonia eventually dies. Marianne says, “To be honest I was reluctant to translate Mum’s private letters – these were my mother’s private things, after all! – but to cut a long story short, I was persuaded. The letters and diary entries dated back to the 1930s and 1940s. The more I read, the more I wanted to read and the more I wanted to know more about that time (a period in history I knew very little). I went to the library and started researching. What started out as a bit of an uncomfortable chore, became a passion and the more I translated and researched, and the more horrified I became. I was reading about awful things which are not common knowledge – far from it. I became determined to tell not only Mum’s story, but the story of all Silesian Germans. The Blue Suitcase is available here from Amazon.